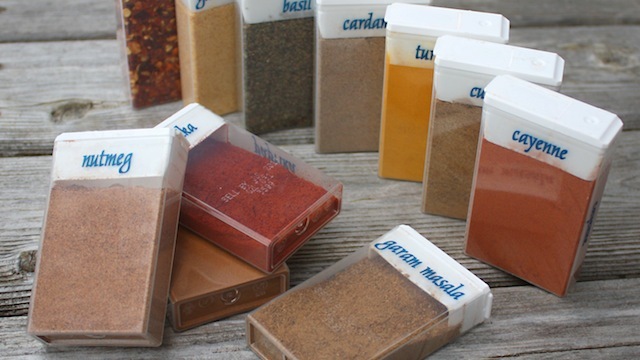 A recent post on Lifehacker shows spices being organized in old tic-tac containers. It’s a fantastic reuse of little containers, and comes in handy when traveling. But tic-tac containers suffer from a quantity problem. If you do cooking in any kind of quantity, you’ll exhaust the spice very quickly and end up having to refill them constantly. So here’s my response to those teensy tic tac containers. These are Tazo tea containers from Starbucks. You should be able to get them in any retail centre in the entire northern hemisphere. Originally each tin held a different variety of fancy teas. After all that boring tea was finished off, these containers found a new life as the best spice containers I’ve ever found. You get 6 containers in all with a sampler pack, although as you can see I’m the kind of guy who cooks with only 3 – salt, pepper, and plenty of garlic powder. The sliding lids can be opened just a crack to sprinkle salt and just as easily opened wide to admit heaping piles of chili powder. 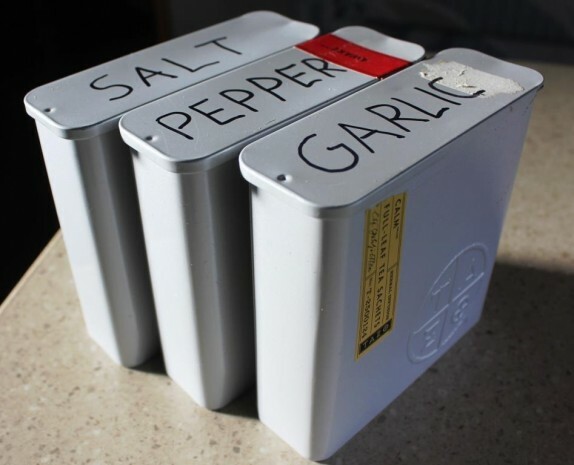 Perfect if you’re someone who cooks on a daily basis, these sliding lid tea tins hold enough salt or pepper or anything else to last months without refilling. But this large volume sits on a small footprint meaning they actually take up very little space. We use them in an RV quite easily.